This Sunday, PSA/DNA will continue to demonstrate it's innovative approach to sports memorabilia authentication with the use of ink and lasers. Every game ball used in Super Bowl XLV will be tagged with an invisible ink to certify the authenticity of the roughly 120 balls that will be used during the game. In addition to 120 footballs, the pylons and the coin used for the coin toss will also be marked. Joe Orlando, the President of PSA/DNA believes this measure will make the odds astronomical that someone will be able to counterfeit game-used memorabilia from this Sunday's Green Bay Packers vs. Pittsburgh Steelers match-up. “The DNA ink has an astronomical 1-in-33 trillion chance of being accurately reproduced by counterfeiters," said Joe Orlando, President of PSA/DNA. 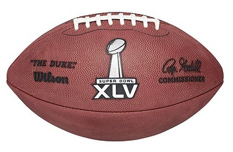 “Many of the game-used Super Bowl footballs are sold by the NFL through charity auctions. The PSA/DNA certification combats potential counterfeiting and helps assure future owners that each ball is genuine." The California based industry leader in the fight against fakes and forgeries uses a synthetic DNA strand that can only be seen with the use of a specific laser. This will be the 13th year that PSA/DNA has authenticated Super Bowl balls. For an added layer of protection, each ball will also have a letter of authenticity and feature a code that can be verified via PSADNA.com. Where do I send memorabilia for trying to authenticate?